Q: Haven't I seen these stories on other shows? Q: Was there an American version of the show? I recall seeing American episodes. Q: Who is the lady dancing in the title sequence? Regardless of what some viewers may think, I had a great time watching this series as a young adult late in the evenings and before the station screening it closed for the night. 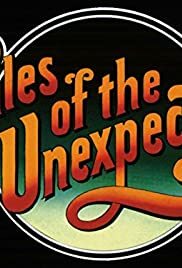 It was brilliantly written by the fabulous Mr Roald Dahl and the theme soundtrack was worth the wait for 'the Unexpected Tale' with a usually camp and fascinating end to unfold. The series starred many budding and now household names from the British Theatre world and yes, the costumes, sets and furnishings were glam and stylish for the period when the world was a more innocent and romantic place to be. I wish it could be screened again in Australia for older and even newer audiences to enjoy again; especially now that the 70's are hip and back!